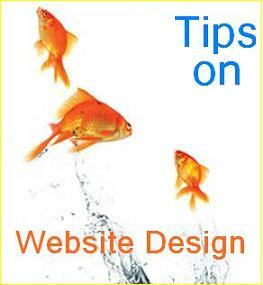 Here is a list of some tips to help you with your web pages. These aresimply suggestions to help you create a better surfing experience for your visitors. Avoid Under Construction signs - All good web sites should always be under construction. Including the words "under construction", or worse yet a blinking animation, only makes you look like an amateur. These notices are so frowned upon that directories such as Yahoo will not accept sites with one on the home page. Most awards programs will immediately reject any sites displaying this dishonorable phrase. Don't use a hundred different fonts on the same page - You can run into all kinds of problems when you use fonts on the internet. There are incompatibilities between operating systems (Unix, Mac and Windows all work differently) and browsers. Fonts have to be installed locally by your visitor - if he doesn't have it installed your page may look funny to him. If you mix many different fonts on your page you are almost immediately known as an amateur. A font or two is fine, but work to avoid the "ransom note" effect. Don't write your HTML to a particular browser - Browsers change very quickly. The one that is popular today may be almost unused in a few months. So don't spend any time trying to fit your HTML to Internet Explorer or Netscape or Opera. Just make good HTML and then let the browser do it's job. Use style sheets - Style sheets (known as CSS) is a way to gain incredible control over how items are displayed on your pages. Better still, you can create one style sheet document and reference it from all over your web. This way, if you want to change, say, your text color from green to blue, you only have to change one file. Every reference to the style will automatically and immediately get changed. Include Meta Tags - Meta tags are used to tell the outside world, especially search engines, all about your pages. You should include the appropriate meta tags on each and every page. These tags need to give a description, copyright notice, author name, language and search keywords. In addition, it is a good idea to include the RSAC rating for content filters. Include a descriptive title - Be sure and write a short, keyword heavy, very descriptive title for each page. Search engines rely on these titles in determining how to index your site. Be sure your title is accurate and honest as well. Avoid lots of moving things - An occasional animation is great and can turn a boring page into an award winner, but don't go overboard. In general, more than one animation per page is excessive. Don't change your visitors settings - Don't change the browser controls, the window size or the cursor. Many surfers (myself included) get very annoyed when these things are changed - and annoyed web surfers tend to never come back. Two of the worst offenses: changing the back function to do something other than go back to the previous page and disabling the right click. - Be sure your dates make sense. For example, 01/02/12 means January 2, 2012 in the United States but February 1, 2012 in many European countries. I prefer dates in the format 1 January 2012, although you may also write 2012-01-02 (year, month and day). - If you write a time, be sure and indicate the time zone. - Be sure and include your area code on the phone number, and specify which country if appropriate. "pre-allocate" the space for the graphic on the display, which makes it all look better. In addition, if ALT tags are included with the images, then something will display even if the image is not. Include ALT tags on all graphics - By including an ALT tag on graphics, you ensure that your page will look good even if your visitors surf with images disabled. Include a contact method - Web sites are created by human beings, and web surfers appreciate knowing they can communicate with someone. Some webmasters like to include a "mailto" link on every page. I prefer using a link to an email form so my email address is not harvested by spam robots. Whatever method you use is fine, as long as visitors have a way of reaching you. Check your pages - Once you've finished a page, be sure and test it. Check each link to be sure it actually goes somewhere. It is also a good idea to check each page in the major browsers - Netscape, Internet Explorer and Opera. The pages will not always look the same, but you should at least make sure they look decent. consistent from page to page. Your visitors will then know what to expect as they surf through your site. Keep your colors sane - A pink background with bright florescent green letters is probably not the best way to win friends. Use all of the colors you want, but it's best not to make your pages resemble an LSD nightmare. Keep down the page size - Remember most surfers are still using dialup connections. Thus, you need to keep your pages small (including graphics). Thirty to fifty kbytes per page is about the right size. Don't use ActiveX controls - Personally, I will immediately leave a site which asks me to download an ActiveX control. Why? Because ActiveX depends upon the surfer trusting the person who created the control. How would I know if this thing is safe? I prefer the Java security scheme, which is much better defined and safer (in my humble opinion). Don't use popup advertisements - You really want to annoy your visitors? Popup advertisements are a good way to get people really unhappy. It's a good idea to never throw an ad up in front of your visitors - that is, if you want them to come back.